Today we’d like to introduce you to Steven Lenchner. I began working with fused glass in 2002, and was excited by the unlimited potential of light and color in its relation to glass. 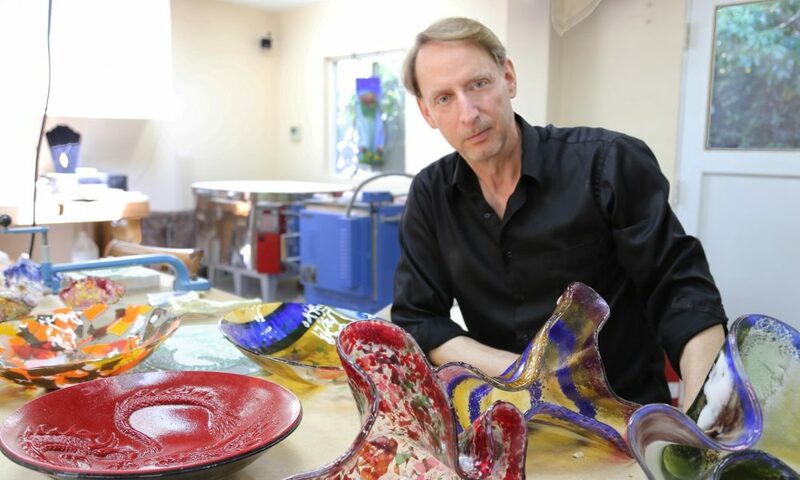 I studied fused glass with prominent artists Roger Thomas, Linda Eithier and Michael Dupile. I created 30 fused glass works of art for my first solo show at Los Angeles’s Brewery Art Walk in April 2003. More recently I have shown my work at Gallery 741 in San Pedro and again at the fall 2014 Brewery Art Walk. My recent works at Gallery show at Gallery 741 in San Pedro, I created 3 new design lines of my tableware using a 3d printer to create the master molds. I have been captivated by light, color and design from an early age; I started lighting theatrical productions and continued throughout my teens and subsequently earned my Bachelor of Fine Arts degree from Ohio University in Lighting and Scene Design for Theater. My career in lighting design included working with many dance companies at UCLA’s Royce Hall and subsequently touring with Lula Washington Dance Theater as Lighting Designer and Stage Manager. In 1987 I joined Imero Fiorentino Associates, a renowned lighting design firm, as Production Manager, working on diverse projects including the lighting of the opening of LA’s California Plaza. I have also worked in television as a Production Manager, Associate Producer, and Line Producer. My production work includes The Oscars, The Emmys, and a multitude of game shows, talk shows, reality shows and sporting events. Art glass in not only a beautiful artistic medium, it is also a highly technical medium. I needed to learn how various glasses behave at different temperatures, and how to fire (in the kiln) them in order to create the visions of my mind’s eye. Some of the techniques I have chosen to work with have taken as long as 2 and a half years to figure out how to fire in my kilns properly. I tend to do very challenging work which takes a lot of time and money to create and perfect. I’ve spent the last 10 years learning how to create casting molds for my glass work and to use the mold to their best effect. As a perfectionist, it can be very frustrating to get the effect or finished results that I have seen in my mind’s eye. Alright – so let’s talk business. Tell us about Lenchner Glass Company – what should we know? Lenchner Glass is a small design and art glass studio. I also give fused glass classes on a regular basis. I create custom architectural work that includes lighted glass counter tops, (https://www.youtube.com/watch?v=V0HopNYtOIg) and wall murals, (https://www.youtube.com/watch?v=fFakGKahw74), room dividers as well as custom tile installations (https://www.youtube.com/watch?v=OzDBGa5Aq5g). I am most proud of the diversity of my work and the satisfaction of my clients for their commissions. One client brought me her ceramic metallic glazed sinks and as that I “riff on it” (https://www.youtube.com/watch?v=zg0xZFfO8Wo). the finished work blew her away. She tells me that she has a hard time getting her guests out of the bathroom because they are so amazed by my work. What sets me apart for other glass artists is the pleasure I get from working collaboratively. Many of my clients tell me that they are not creative and that they’re not sure what they want. I ask them to start clipping pictures of colors, designs and other sources that demonstrate what they are interested in. It makes them so happy that the can communicate creatively by doing what I have suggested. The feedback on my work form my friends and clients as well as their and encouragement help propel me forward. John Williams, the owner of Pacific Art Glass, has been generous in sharing my knowledge with me. I consider him to be a mentor. He is always blown away by my work. I’ve also had the good fortune to take Class from Michael Dupile (https://www.michaeldupille.com/), Linda Either (http://www.lindaethier.com/), Roger Thomas (http://rogerthomasglass.com/#home) and Bert Weiss (http://www.customartglass.com/). They are consummate masters at their work and are incredibly generous in sharing their expertise with me. Michael and Linda have been particular influences in that I have learned so much about glass casting and mold making from them. The examples of the work above and the artists who have share their knowledge with me, inspires me. My lighted countertops and back splashes cost about $475.00 per square foot (including lighting). My dinnerware sets cost about $900.00 for a place setting for 4 people including a serving bowl and platter. My custom work pricing depends on the design and how large it is.